So who's got an Air Fryer? at Amazon. I've been thinking about getting one for months. And when I saw this one on sale for $65, I grabbed it. I'm not familiar with the brand, but it has a lot of good reviews. I hope it's not too small. I'm wondering if I should have gotten the 5.8qt model. Anyone have some good tips or recipes? Are there any accessories I should buy? I was thinking of getting some parchment papers to help with cleaning, but I was worried they might block the airflow. I just ordered the Cozyna SAF-32 Digital Air Fryer (3.7qt) at Amazon. I've been thinking about getting one for months. The 3.7 qt. size is plenty big enough for cooking for two people. That's the size air fryer my wife bought me for Christmas a couple years ago, and we love it. If you like chicken wings, that's something easy and delicious you can start with. Just as tasty, and definitely healthier than deep fried wings. I use a tasty dry rub called Char Crust. They make a bunch of different flavors. If you like chicken wings, that's something easy and delicious you can start with. Just as tasty, and definitely healthier than deep fried wings. I use a tasty dry rub called Char Crust. They make a bunch of different flavors. When you cook chicken wings, do you need to have a single layer in the pan? Or can they be piled on top of each other? Looks like the Char Crust rubs are sold at my local Fresh Market. I'll check it out next time I'm there. Throw a package of chicken drumettes in there. You can pile them up. Cook for 30 mins, opening up and shaking the basket every 5 minutes. Put in a bowl with wing sauce and shake. Easy and delicious. You can definitely stack them, just try pack them in tightly, and stir them around a couple times, like every 7-8 minutes. Total cooking time will be 20-25 minutes, depending on how large your wings are. Worth noting here that I'm referrring to fresh or defrosted chicken wings, and not frozen ones. The whole key to the air fryer "technology" is the convection (a.k.a. moving super-heated air), so you want to make sure the air can circulate around the food as much as possible. So has anyone used this for "fried" shrimp or chicken breasts? I hate wings (blasphemy, I know). I can't bear to eat real deep fried food and like the OP, I've been eyeing one of these for months. I just got one... $42 out the door... almost half off at Amazon today. We need a Cooking Talk forum. I got one . . . and a sous vide . . . and a Chinese cookbook (don't forget actual books over $20 have a $5 off code PRIMEBOOKS18). Not working on amazon prime day proved to be expensive. Did you folks get the Philips or the Chefman? The reviews on the Chefman are a bit spotty, but it's half the price. For me, the Chefman showed up as shipping in 1-2 months, so I passed, despite the reviews looking pretty good. I got a Philips 9621. There's also a 9220 (the one showing up for me as the primeday deal). Both are $99 on sale and I spent way too long trying to decide which was better. I went with my choice based on only 5% hating it vs 10%. I have no idea if this is for me, but I've realized I need to simplify dinner on days I work late. Thanks! Yeah the shipping time does scare me a bit, might have to lean towards the Philips. My air fryer arrived today. I broke it in with some potato wedges tossed with oil and seasoning. They turned out nice and crispy. Then I did a batch of fresh chicken wings. They were perfect, just like from a restaurant. So far, I'm really happy with it. Regarding the size, it's smaller than I expected. The interior pan is about 7x7 inches. It'll handle an entree and side for 1 person (fish fillet or chicken breast with vegetables). But you can't cook a family meal in it. Perhaps a side dish for a family meal. It won't fit a whole chicken, maybe a cornish hen. I was able to do a dozen wings, no problem. It could probably hold up to 20. I think it might fit 5 full size drumsticks, or a package of brats. But if you're cooking big chicken breasts or fish fillets, it'll probably only handle 2 at a time. I never paid attention to the shipping length when I ordered... it's not a big deal to wait until September. We asked for a Food subforum but it got nowhere. I have the Char-Broil Big Easy for outside use. I don't like it. It takes a long time, especially when dealing with wind, and cold in the winter months. The best thing I've done in there is wings, and I recommend doing them in single layer, but I have an insert to get 2 levels. I much rather use my oil fryer. I have much better control and results with it. I've probably done close to 30 turkeys in there and everyone has come out great. The first one I did in the air fryer was under cooked in a lot of spots even though my internal temp check showed otherwise. Well, we will try a few more things, but last night we made a mix of pre-made convenience foods and vegetables, and I don't get the hype. Pizza rolls---these are not as good as I remember (I remember them being greasier and more delicious in a these are so bad for you way). They came out no better in the air fryer than the oven, which we used to make a second batch. You can cook more in the oven at once. Pot stickers-- coated in oil then airfried. Coated in more oil, and fried some more. These were weird and baked-like. Husband made more in a pan the traditional way. These are better deep fried, pan fried, or steamed. Egg rolls-- pretty much same as a hot oven. Been years since I bought frozen egg rolls rather than making them, and this reminded me why. Yuck. Fried fish (large fishstick type): Okay, these were a little better in the air fryer than they would be in the oven. Potato chips-- Okay, kind of like baked Lays. I make homemade chips every year or two and they are much better fried. But these were lower fat, so that's sort of an advantage, though I think when you're bothering to thinly slice a ton of potatoes, it's better to go all out and fry them. I think buying a bag of chips makes more sense than using an air fryer. Roasted Brussels sprouts-- better in the oven because you can do more at once. They did come out okay, though. So . . . I think it's a waste. We'll try some recipes (wings etc) and of course, oven fries, but I'm thinking it's not worth the price and the large footprint in my kitchen. I have a deep fryer that I rarely use, and two ovens, one of which has a convection setting, so I'm thinking this isn't unique enough to add to the kitchen--I can use the oven on convection for nearly the same results, or deep fry for special occasions when we aren't going to worry about calories. The air fryer does a great job of cooking sausage links. I just dump in a package of Johnsonville Brats or Italian Sausage. Cook for about 15-20 minutes at 360 degrees. They turn out perfect. A nice snap on the outside and juicy inside. Next time I might toss some onion and pepper slices in oil and add them during the last 3-5 minutes. I'm wrestling with getting one of these. I'm not interested the zillion things you can do with it, just one thing, cooking stuff that would normally be cooked in a deep fat fryer. Junk you pick up from frozen section of grocery store. French fries, onion rings, corn dogs, various kinds of breaded chicken, country fried steak. I ditched home deep frying years ago and have used conventional oven since. Of course the stuff never comes out leaving you satisfied. I'm not looking for an alternative to deep frying, but a better alternative to conventional oven for foods intended to be deep fried. "Don't see the big deal"
They seem to hold small amounts. Get the largest capacity, but it won't be cheap. Also, try deep frying in coconut oil. I got one about two months ago and love it. Throw some frozen Ore Ida tater tots with a bit of oil and in about 10-15 minutes they're done and taste as if they were deep fried. 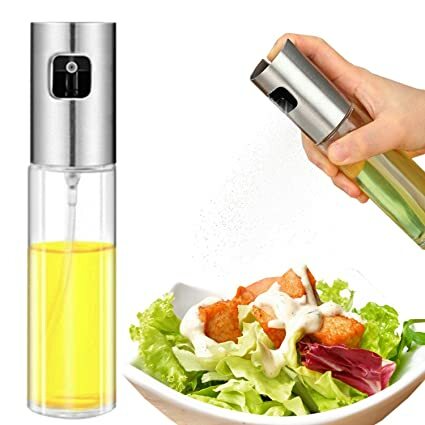 I would recommend getting an oil spray bottle and use it to give whatever you're cooking a light coating. We got one for Christmas. It’s a B&D toaster oven air fryer combo. Still working out the ways to use it. Did some sweet potatoe fries and they were a little burnt on one side and still soft on the other. Moved them around on the tray but not enough I guess. Last edited by Redeyejoker; 12-27-18 at 05:11 PM. View Next Unread Ever take a dump so good you want to lay down and have a cigarette?